There's a lot of attention right now on improving attendance in schools — making sure kids don't miss too many days. But what about the littlest students — those 3 and 4 years old? New research shows that if kids miss a lot of preschool, they're way more likely to have problems in kindergarten or later on. 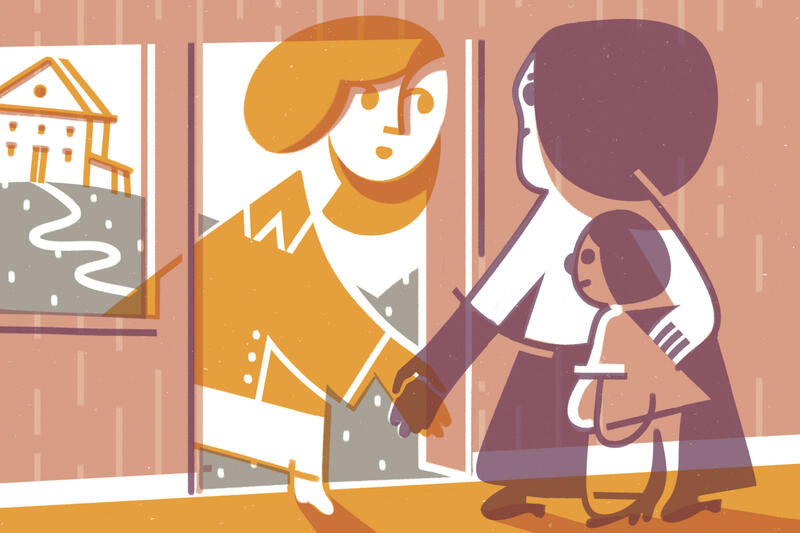 Researchers and many top preschool programs are focusing on one solution as a way of getting pre-K attendance up: Home visits at the beginning of the year, before kids start missing and before parents have a chance to feel skeptical about the school. "No parent or family member wants the first contact to be, 'Hey, you need to come to school for a parent meeting and it needs to happen now,' " says Rachel Wessler, a teacher at Burrville Elementary School in northeast Washington, D.C. Wessler trains other teachers at Burrville to do home visits, which are a big part of the school's overall strategy. "We try and do a lot of positive contact at home," she says, "so if there is a difficult conversation regarding attendance, the parent understands that this is coming from a place of love." This is especially important for the 3- and 4-year-olds in the preschool program, who often struggle with attendance. At the beginning of the year Wessler's pre-K class had 17 4-year-olds, and she made plans to visit each one of their homes. In October, she still had several on her list, including Za'montae Wise. After months of back and forth, Wessler and Za'montae's mom, Antonette, found a time that worked. Antonette Wise and her four kids live with their extended family in a big house, just a short drive from Burrville. Teachers from Burrville usually do home visits in pairs, so Claire Gunner, a second-grade teacher, came along. Gunner is just here to listen, but she taught Za'montae in preschool last year, so she's already familiar with the family. This visit is all about getting to know each other — Wessler wants parents to know that "I'm a real person." She asks about Wise's expectations. What does Za'montae's mother want from his teachers? "Just work with him and be patient with his learning," Wise tells the teachers. "He's getting it, but he's pulling back. And he has an attitude, too, and that is not acceptable." "So you're saying you want me to enforce behaviors?" asks Wessler. Wise nods her head. Yes. This meeting is a two-way street. Wessler is learning about little Za'montae, and Wise is getting a feel for the adult who spends the day with her son. But after all the preliminaries, Wessler gets down to another big reason for this visit. "I expect that your child comes to school every day," the teacher says. "On time. Ready to go." So far, Za'montae's attendance has been good. Wessler's mission here is to keep it that way and to reinforce the message about the importance of attendance. "We can help Za'montae with everything he needs in order to be successful," she says. "We feel very confident. He just needs to be there; he's just got to come." This conversation is key, says Michael Katz, a researcher at the Urban Institute who looked at D.C. pre-K programs to figure out how schools get kids to show up. "Home visits were an essential component of their strategy," says Katz. Schools with high preschool attendance, he says, have one important thing in common: "connection with families." Home visits aren't new. Head Start, the national pre-K program for low-income kids, has always required home visits. But in the past year, schools — directed by the federal government — have renewed their focus on attendance in the elementary years, and pre-K offers a chance to get kids on the right foot from their very earliest encounters with school. Home visits can help establish a relationship before there's a problem. They can open up lines of communication. "If you don't have a good phone number for the family, or if you don't know the family, you're working from behind," says Katz. Wessler and Gunner agree. They tell me that getting a working phone number is a major victory. "If there is a student struggling with attendance, we can call and we'll get an answer about it," says Gunner. But these visits are a big ask for teachers. Wessler usually spends about half an hour with families. Try multiplying that by 20 or even 30 for a whole class. Plus, schedules are hard to coordinate. Wessler had been trying to set up this visit with Za'montae's mom since July. I ask Wessler about the time commitment and she shrugs it off. She tells me about her first year of teaching, how she thought about doing home visits, but only managed to do a few. "I was a new teacher. I had so much to do that I didn't make it a priority," she says. Her second year, she did make it a priority — and visited the homes of all her students. She says that as a result, she felt supported by a community of families, she had good communication with parents and guardians, and her kids performed better on their assessments. She was hooked. Before we leave Antonette Wise's house, Wessler checks to make sure she has all the right contact info. Yep, each has the other's cellphone number and they're connected on Facebook. Now, any time there's a problem getting Za'montae to school his mom just needs to pick up the phone. There's a lot of attention right now on improving attendance in schools, making sure kids don't miss too many days. That means the littlest students, too. New research shows that if kids miss a lot of preschool, they're way more likely to have problems in kindergarten or later on. At an elementary school in Washington, D.C., Preventing that slide is all about family engagement. Elissa Nadworny of the NPR Ed team tagged along with one teacher who is visiting parents at home. RACHEL WESSLER: Hi. Is Ms. Wise here - Antonette? Hi, mommy. ELISSA NADWORNY, BYLINE: Rachel Wessler teaches early ed at the school down the street. She's here at Antonette Wise's house to talk about Za'montae, Wise's 4-year-old son who started out the year in her pre-K class at Burrville Elementary. WESSLER: You know, I'm a native Washingtonian. I've been at Burrville teaching pre-K for a very long time, and I love it. Would you share a little bit about yourself, Ms. Wise? WISE: I've been back in D.C. now for about four years. Za'montae is - this is his second year. He's doing good so far. NADWORNY: This visit is all about feeling comfortable and getting to know each other. Wessler asks about Wise's expectations. What does she want from Za'montae's teachers? WESSLER: Oh, trust me. It's pre-K (laughter). WISE: Right. He's getting it, but he pulls back. But see, he has an attitude, too, and that is not acceptable. So you still - you've got to patient. WESSLER: So you expect me to enforce behaviors, is what you're talking about. NADWORNY: This is a two-way street. Wessler can learn about little Za'montae, and his mom can get a feel for the adult that spends the whole day with her son. But there's another reason for this visit. So far, Za'montae's attendance has been good, and Wessler's job is to keep it that way. WESSLER: ...On time, ready to go. WESSLER: Ready to learn, yes. NADWORNY: And research shows that visits like this one are really helpful in keeping good attendance, especially when they're done early on in the year. WESSLER: We can help Za'montae with everything he needs in order to be successful. We feel very confident. He just needs to be there. WISE: Yeah, that's the thing, yeah. WISE: He's got to come. MICHAEL KATZ: That's kind of the base work that's done on attendance. NADWORNY: That's Michael Katz, a researcher at the Urban Institute. He looked at D.C. pre-K programs to try and figure out how schools get kids to show up. He found schools with high preschool attendance had one important thing in common. NADWORNY: Home visits aren't new. Head Start, the national pre-K program for low-income kids, has always required home visits. But in the last year, schools, directed by the federal government, have renewed their focus on attendance in elementary school. Home visits establish a relationship before there's a problem, and they can open up lines of communication. Here's one thing I heard over and over again. KATZ: If you don't have a good phone number for the family or you don't know the family, you're working from behind. NADWORNY: But these visits, they're a big ask for teachers. Wessler usually spends about half an hour with families. Imagine a class of 30. That's a lot of time, and schedules are hard to coordinate. Wessler has been trying to set up this visit with Za'montae's mom since July. WESSLER: It sounds like you just want him to be successful in all that he does. WISE: I just want him to be successful at what - whatever, you know, he chooses to do, as long as it's legit and he's going to be OK.
WESSLER: All right, well, thank you so much. NADWORNY: Now that they've exchanged numbers, any time there's a problem getting Za'montae to school, mom just needs to pick up the phone. Elissa Nadworny, NPR News, Washington. Transcript provided by NPR, Copyright NPR.